Taught by leading experts, this LLM will enable you to apply business law in an international context – a specialism that is highly sought after by a range of public and private sector organisations. With more companies seeking to operate across international boundaries and transnational trade agreements coming under increasing scrutiny, specialists in international business law are highly sought after. The LLM International Business Law offers the freedom to design your own course by choosing from a range of optional modules, which cover topics relating to both private commercial trade and country-to-country agreements – an area that has become a hot topic in the context of recent events such as Brexit. Whatever path you choose, you’ll be taught by renowned, research-active academics who are engaged with key international law and commerce organisations, exposing you to new developments long before they reach the text books. While our students are typically law graduates, this programme will also be of interest to business and legal professionals working in the national and international commercial sector. Our postgraduate community includes high-calibre students from around the world. As well as developing your understanding of legal and business practice in other countries and cultures, this will enable you to build up a global network of contacts that will be invaluable as your career progresses. The LLM International Business Law can be taken full time over one year or part time over two years. You’ll be required to complete a number of optional modules and a dissertation. At the start of the programme we offer an intensive, week-long introductory course on common law. This is of particular benefit for students from different jurisdictions and countries, giving them a thorough grounding in the workings of this important legal system. There are no compulsory taught modules on this programme; instead you can build a course that will help you to achieve your career goals. You can choose from a range of optional modules that focus on private commercial trade and also country-level international trade agreements – a particularly pertinent area of study in the light of current world events. The modules capitalise on our academics’ expertise in areas such as secured transactions, arbitration and shipping finance and law, as well as contracts, internet trade and intellectual property law, World Trade Organization rules, corporate governance and insurance law. You can also choose a dissertation topic that will further your interests and career prospects. You’ll be matched with an academic supervisor with relevant expertise, who will support you in formulating your thesis, conducting independent research and writing up your findings. 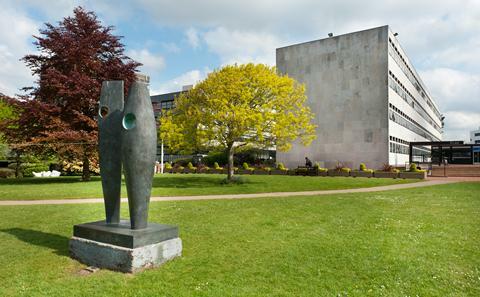 Southampton Law School is a hub for world-class research. You’ll benefit from our academics’ direct involvement in projects undertaken within prestigious centres such as the Institute of Maritime Law and Institute for Law and the Web. In addition, academics are engaged with key international organisations such as the United Nations, European Union, International Chamber of Commerce and International Maritime Organization. Their knowledge of the latest sector developments and research findings will feed directly into your learning. Regular talks by industry speakers, within your modules and at extra-curricular seminars and events, will also enrich your learning and ensure you stay abreast of current issues. Past speakers have included a senior research fellow who talked about virtual commodities, representatives from major banks and insurance companies, and legal practitioners from firms such as Holman Fenwick Willan and Roose & Partners. Our industry partners also offer prizes for exceptional performance, which can take the form of monetary awards or work placements. For example, Campbell Johnson Clark offers a placement to the student with the highest combined mark in International Trade Law and Carriage of Goods by Sea. Our academics are inspiring teachers who are active in research and advisory capacities. They bring the latest developments in international business law to your learning. Take your career to the next level by gaining specialist knowledge in international business law. Covers both private commercial activity and nation-to-nation trade agreements. Taught by renowned academics with expertise in areas such as secure financial transactions, arbitration and shipping finance, as well as contracts, internet trade and intellectual property law, corporate governance and insurance law. Our diverse, close-knit postgraduate community will enable you to develop a global network of contacts that will be invaluable in your future career. An Upper Second Class Bachelor's Degree in Law (or a degree with a substantial legal component) is normally required, but account may also be taken of practical work experience or professional qualifications within the relevant field of study. We welcome applications from international students. Mature applicants without formal qualifications but relevant work experience are also encouraged to apply. Access to the internet, Word Processor (MS Word compatible) and an email address are also required; webcams desirable. You’ll graduate with a skill set that will be of great value to a variety of organisations. For example, you may choose to work for a commodity house, a large multinational law firm, a global corporation or a government body. You’ll learn through lectures, seminars and tutorials as well as independent study. Our academics use a small-group teaching approach, enabling you to explore your chosen subjects in depth. Seminars and tutorials are often structured around a particular case or a relevant piece of research, which you’ll be encouraged to explore and debate. You may be asked to prepare presentations or argue a case in a moot. Some modules may incorporate preparing a response to a public consultation, or examining the legal implications raised by a new convention and drafting a clause to tackle potential problems. As well as enhancing your legal skills and understanding, these activities will help you to develop transferable skills such as team working, communication, critical appraisal and logical reasoning. You’ll also gain an insight into other cultures and professional practices by working with a diverse group of students. In-class feedback will enable you to identify strengths and areas for improvement. Formal assessment methods will vary depending on which modules you take, but will include exams and coursework as well as your dissertation. Our excellent library service holds an extensive range of books, specialist journals and online databases. For your dissertation research you’ll also have access to the Philippa Kaye Library in Maritime Law located within the Institute of Maritime Law. Group study rooms are available for work and discussion with your peers outside class, and the Law School’s facilities include a purpose-built moot room. Taking part in the LLM Challenge offers an additional learning experience that will help to develop your collaborative working and leadership skills. It involves students across all our LLM pathways; they are assigned to a team and given a current topic to debate, competing for a small monetary prize. You’ll become part of a friendly, informal learning community with a relatively small postgraduate intake. This not only enables you to get to know your fellow students well, but enables us to offer plenty of support to help you succeed. Every student is allocated a personal academic tutor who can advise on course-related matters, and you’ll be able to talk to your module tutors about any subject-specific queries. In addition, you’ll have access to the University’s wide range of language, academic and welfare support services.